For 2018 and beyond, the Golf Shop would like to offer Breezy Bend members an automatic 10% discount on all apparel, shoes and bags and a 5% discount on all golf clubs, golf balls and accessories. In addition, for any purchases of 4 or more pieces of apparel at any one time, a member will receive an additional 5% off! Although the Golf Shop at Breezy Bend has always matched or beaten our competitor’s price on current items, we would like to further extend our gratitude to the membership for their loyalty to the Golf Shop. Your Golf Shop takes great pride in providing its’ membership with the latest and greatest in golf and lifestyle product offerings. Our goal is to offer great products at a variety of price points and for our friendly and knowledgeable staff to provide the membership with legendary service! We thank you for choosing the Golf Shop at Breezy Bend for all of your golfing needs and look forward to providing even better products and services in 2018 and beyond! 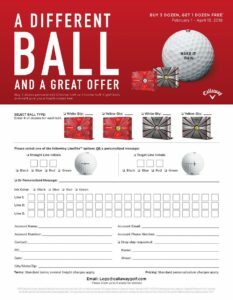 (These standing membership rewards cannot be combined with any other promotions held within the Golf Shop and will be taken off of regular retail pricing).